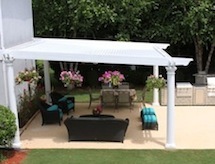 Adjustable Patio Covers is the Nation's number one outdoor shade solution. We are committed to providing quality products that achieve all your needs and are built to last. Our dealer network extends across the whole nation and we can help customize a solution for you. Open pergolas or lattice patio covers cannot provide 100% of the shade you want during the hot summer days, but they do allow for maximum airflow, as the warm air is released upwards out the open cover. Awnings provide 100% shade, or 100% light. Awnings can also block the amount of possible airflow you receive, and can result in a stuffy atmosphere creating a greenhouse effect in large areas.Our Adjustable Patio Cover system lets you enjoy the best of all worlds, all seasons. Our number one system, Arcadia, is dynamic and can be transformed according to weather conditions and your demands. This means that you are in charge of the amount of light and shade you wish to receive, including protection from rain or sun, while not missing out on a refreshing summer breeze.